Tadano Oceania Pty Ltd has restructured its sales team to continue the momentum of the brand’s penetration in the Australian crane market. The sales teams in both Queensland and NSW have been upgraded. Philip White was added to the team in 2012, taking up the position of Queensland, NT and PNG Sales. Since commencing at Tadano, Philip has already noticed a growth in the market with key regions such as Far North Queensland and Darwin experiencing an upswing in demand for quality Tadano cranes. He explains that the growth has been driven by the three and four axle all terrain Tadano cranes. The arrival of the big Tadano ATF 400 model with its massively impressive capabilities is expected to be the biggest driver. Bill Dunn, who has been appointed to the newly created position of Mantis Sales, is the latest addition to the Tadano Oceania sales team, with the new appointment underscoring Tadano Oceania’s commitment to the Mantis line of crawler cranes. With a sales and support background in a variety of industries, Bill has embraced the steep learning curve of the crane industry. Since commencing at Tadano Oceania, Bill Dunn has become exceptionally well versed with the Mantis brand, and also the demands of the Australian industry, in particular the mining sector. Justin Andrews has been appointed to the position of Tadano NSW Sales to drive the sales effort in NSW. Justin supports a wide range of customers spread across a diverse geographical landscape including metropolitan crane hire businesses, rural customers and the mining industry. 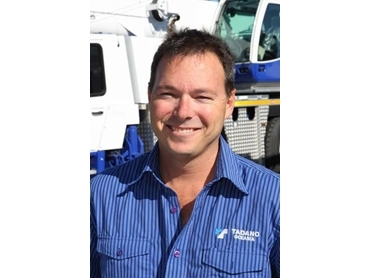 Justin Andrews joined Tadano Oceania soon after the company established its Darra (Brisbane) facility. Relocating to Sydney in early 2013 to head up NSW Sales, Justin has in a short period of time, restructured the Sydney branch office to now include service and parts support. A service agent has been appointed at Orange in a strategic move designed to provide better support for Tadano customers in Western NSW. A world leader in the crane industry, the Tadano brand encompasses all terrain cranes, truck cranes, rough terrain cranes and Tadano Mantis telescopic boom hydraulic crawler cranes.